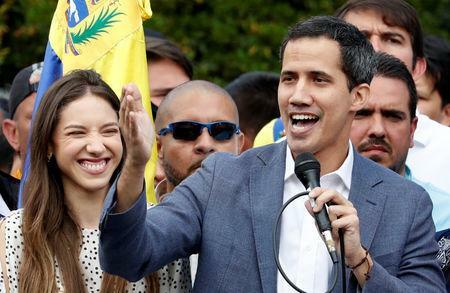 MADRID (Reuters) - Major European countries threw their weight behind Venezuela's opposition leader Juan Guaido on Saturday saying they would recognize him as interim president if Nicolas Maduro failed to call elections within eight days. Earlier this week, the United States declared support for Guaido, with Vice President Mike Pence calling Maduro "a dictator with no legitimate claim to power." Since then, most Latin American nations and Canada have all said they back the 35-year-old opposition leader. "The government of Spain gives [President] Nicolas Maduro eight days to call free, transparent and democratic elections," Spain's Prime Minister Pedro Sanchez said in statement. "If that doesn't happen, Spain will recognize Juan Guaido as interim president in charge of calling these elections." French President Manuel Macron sent a tweet echoing Sanchez's comments almost simultaneously. "Unless elections are announced within eight days, we will be ready to recognize @jguaido as 'President in charge' of Venezuela in order to trigger a political process," Macron said. EU foreign policy chief Federica Mogherini reiterated Brussels' call for Venezuela to hold free, transparent and credible presidential elections, adding that failure to do so would prompt further action by the EU. Russia, meanwhile, called for the United States and Europe to cease interfering in Venezuela. "The cynical, overt interference in the internal affairs of a sovereign state continues. It must stop," the Russian foreign ministry said in a statement on Saturday.